As long as design education maintains its focus on a narrow, aesthetics-based curriculum, it cannot shed its image as a Mickey Mouse subject, over-subscribed with failed fine artists. There is an episode of the television comedy Red Dwarf where Lister, one of a group of assorted life forms lost in space, mentions that he went to art school. Incredulous, another character asks how he, of all people, had got into art school. The answer – ‘I failed my exams like everyone else’ – typifies a common attitude towards art and design education. For all that design education can appear exotic, extravagant and exclusive, it is often tinged with academic failure, and out of step with a literary culture. Does it not have the highest percentage of dyslexic students of any degree-level activity? And does this not itself point to our culture’s emphasis on the literary as opposed to the visual? Despite such perceptions, it was in fact UK art and design schools that pioneered further and higher education during the nineteenth century. The Royal Academy Schools of Design were set up in 1768; and the Normal School of Design (later the Royal College of Art), which opened in 1837, was the precursor of a network of schools that were well established by the mid-1850s, long before the universities of Manchester (1851) or Bristol (1876). At the time of the industrial revolution there was a recognition that design had a fundamental role within the culture, yet to many of its modern-day ‘recipients’ it is an impenetrable activity. In 2005 graphic design students at what was then London College of Printing (now London College of Communication, or LCC) produced a degree show catalogue on the theme of what relatives and friends thought graphic design was. The responses were fascinating, not least because, although the majority could name related outcomes – ‘slogans’, ‘logos’, ‘advertising’ – they exhibited little knowledge of the breadth of graphic design beyond limited corporate and commercial applications. ‘There are far too many graphic design students graduating each year’ is a comment as commonly made in industry as in academia. The inference is that there should be a finite number of practitioners, although no one seems willing to spell out what this number should be. The creative industries now account for seven per cent of the UK’s economy, yet in 2005, while there were 10,345 students graduating in English and 9195 in history, the total graduating in design-based activities – of which graphic design is only one part – was 11,000. There are 349 graphic design degree courses in the UK, plus a further 33 visual communication courses, in contrast to 2891 in English literature, 672 in fine art and 818 in divinity. The subject itself has diversified significantly in the past decade and encompasses a very broad range of activities from the practice-based to theoretical, from type design to design journalism, from criticism to education, from interaction to management. In some areas, and from some courses, 70 per cent of graphic design graduates do gain employment within the industry within six months of leaving full time education. And what of those English and history graduates? For what industries and professions are they naturally fitted, apart from education? Given the size of the cultural and creative industries, a proportion must inevitably find their way into areas and activities that have a greater relationship to design than their original specialism: advertising, copywriting and publishing spring immediately to mind. Besides the much-voiced concern over the number of graphic design graduates, another constant refrain is their supposed poor quality. There is, however, little consensus on what constitutes a good graduate, and ample evidence that a student can present the same portfolio to two potential employers and have totally different responses. There can be few other industries that expect their graduate employees to exhibit ‘fully formed’ professional skills immediately on leaving education. Five years ago the Quality Assurance Agency, which oversees quality in British higher education, began publishing ‘subject benchmark statements’, which describe the essential skills that define degree-level education in a range of subject areas. Subject knowledge and skills were of obvious importance to all, but it was the emphasis placed upon transferable skills that stood out, and marked the similarity between very disparate subjects. This suggests that skills such as interpersonal communication and collaborative working are as important as subject expertise in enabling graduates from any discipline to gain employment. Unlike, say, geography, graphic design remains to an extent an isolated and self-referential activity, that has not as yet created a ‘dialogue’ with other disciplines to the intellectual benefit of all concerned. The geography taught a generation ago was classed as a science and limited to three areas: physical, economic and political. It has since expanded into the humanities, acquiring dozens of subjects such as critical geography, geomorphology, behavioural geography, humanist geography, philosophical geography, oceanography, globalisation. Equivalent relationships have developed in anthropology, linguistics, archaeology and sociology. A professor of engineering who recently visited the LCC came across a piece of student work, unfinished, that comprised coloured rectangles placed randomly on a sheet of paper. Its meaning was not apparent, but the designer explained that he had been dropping playing cards on to a piece of paper and recording the pattern created. As to the process and its purpose, the student knew he was experimenting with probability but his terms of reference were limited and consequently his research was haphazard; he was working purely intuitively. The engineer was nonetheless fascinated. An engineering student, he explained, would have presented the results as statistical data, which, although perfectly clear to a knowledgeable reader, lacked the immediate accessibility of the image that the design student had produced. Perhaps a combination of the engineer’s research methodology with the designer’s visual communication skills could produce exactly the kind of synergy that graphic design currently lacks. In order to do this, however, we need to consider the core body of knowledge that identifies design – or at least certain specialisms within it. There is obvious potential for information design in its broadest context, although other specialisms, such as illustration, may also benefit from expansion into other areas and disciplines. 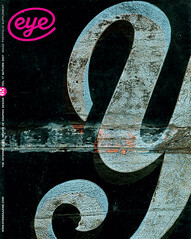 So what of the contention I first made in 1997 (‘The end of the line’, Eye no.25 vol.7), that we should open up the subject to those with no background in design? Ten years on, our subject still (mostly) remains the province of those who exhibit particular skills, which are considered innate and therefore exclusive. The necessity of producing a portfolio demonstrating largely manual skills, with some reference paid to conceptual ability, ensures that the subject remains mysterious and inaccessible and incapable of any cross-discipline dialogue. Graphic design in tertiary education also requires a level of prior expertise that no other subject demands. It is as if an applicant for a degree course in medicine or law had to demonstrate almost complete knowledge prior to studying the subject. non-traditional sources; some even think those who do not have an art and design background make the best students. This may have something to do with the conjoining of design with art, and the emphasis that this relationship places upon self-expression and unspoken references to a ‘creative muse’. The LCC catalogue included this put-down (from a ‘friend’): ‘Graphic Design is for people who consider themselves “graphic artists”, but can’t actually cut it in the art world and secretly want to be rich, capitalist money spinners, hell-bent on creating irritating slogans and adverts just to piss off us real artists!’ The idea of a symbiotic relationship between art and design persists. It is maintained at the earliest level at school and through GCSE curricula, where graphic design is poorly defined, design principles are not addressed, and product, however inappropriate, dominates process. Furthermore the references remain orientated towards fine art; too often course material introduces students only to artist practitioners, with little or no reference to design practitioners or movements. This lack of an appropriate definition often persists at foundation level, where only ten years ago some 70 per cent of tutors came from fine art backgrounds. Anecdotal evidence suggests that this percentage has not reduced greatly. The same emphasis on expression at the expense of information and communication is still seen in the portfolios of students entering degree-level graphic design education. Few portfolios demonstrate evidence of formal teaching of design principles and elements, and little in terms of processes of conceptual development or even aesthetics. Meanwhile, management courses introduce students to Edward De Bono’s ‘six thinking hats’ and other methodologies associated with ‘ideas generation’, and some engineering degrees offer units in aesthetics. Yet we still seem to expect that graphic design students come to the subject with an innate facility that is the result of genes or natural osmosis and is maintained through serendipitous study. There is a need for a fundamental overhaul of school graphic design curricula that recognises and addresses the differences between art and design, but even more profoundly for a recognition that there is such a thing as ‘visual intelligence’ and that this can be developed in those with no prior experience. The LCC has created a course that is at the level of a final year of an honours course but is an immediate precursor to postgraduate study. The graduate certificate and diploma course in visual communication admits a broad range of students, many of whom possess degrees in a wide range of subjects from English literature to anthropology; few have any design experience. Their strength instead lies in their research capabilities and their capacity to think beyond pure aesthetics. Unlike design students, who tend to present unmediated sketchbooks that are non-reflective, non-iterative and certainly do not clarify or communicate their concepts and their development, these students produce research that is structured, ordered and systematic. The ability to propose, test and evaluate a hypothesis is paramount to success. Even more importantly, they learn basic compositional and typographic skills within a short period, enabling them to apply this visual knowledge to the communication of their research. The application of design principles gives clarity, order and assists the presentation of their research, and elucidates and communicates their hypotheses. They use design as a communicative tool – not as an end in itself. Their choices of self-initiated projects indicate their breadth of interest and an awareness of a ‘wider world’ and sadly highlight the limited scope of some design students whose projects emphasise stylistics, and artefact. The course leader, Tony Pritchard, cites one student with no previous design education who used the knowledge and expertise gained in a BSC in psychology, combined with a newly discovered visualising ability, to create a notational system for communicating the content of dreams, to help discern a patient’s mental state. ‘Graphic design isn’t the central thing,’ says Pritchard, ‘it is how people inhabit it, and people with interesting backgrounds and perspectives on the world do just as well, if not better, than those whose sole interest is visual expression. ‘The two biggest barriers to innovation are ignorant chief executives and ignorant designers,’ declared Business Week’s assistant managing editor, Bruce Nussbaum, in his keynote speech at the Royal College of Art’s Innovation night in July 2007. ‘Undergraduate designers need to expose themselves to the tangible, everyday challenges facing the outside world, rather than rely solely on abstract, college-based learning,’ he suggested. Although ‘abstract, college-based learning’ may not be an accurate assessment of design teaching, there is a fundamental truth in the assertion that design students lack understanding of a world on which they may exercise significant influence. If design education persists in approaching the subject as an adjunct of art; and if we fail to identify a corpus of knowledge, particularly at secondary level, that clearly defines itself as an activity with relevance to and potential synergies with other subjects and disciplines, and if we fail to engage with our audiences, we will find that others outside the subject will make those connections for us. Above all, we need to convince our culture to reconsider the narrow definitions of intelligence that persist in referencing the literary over the visual, and stop viewing the subject as the province of the ‘naturally gifted’.